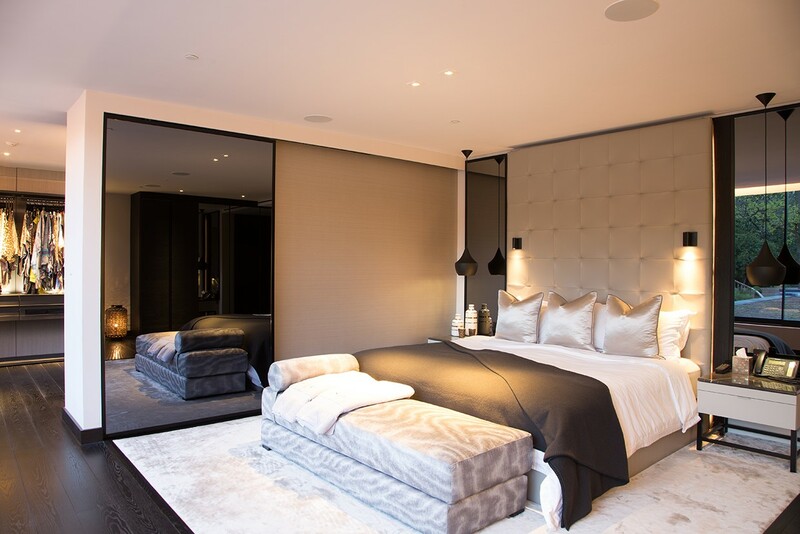 This fully bespoke installation in a large, luxury property in London is the perfect example of how Pro Install AV work with world-class interior designers to integrate smart home systems in a which effortlessly enhances the aesthetic character of any modern home. 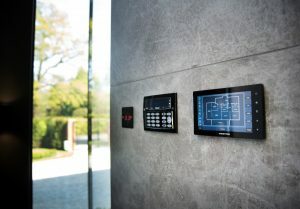 With audio, video and control added to 19 rooms, as well as three vast garden zones, it also serves to demonstrate the creativity and ingenuity of our team in meeting the unique needs of our clients. As renowned their array of beautifully crafted ceiling and in-wall speakers as for their cutting-edge outdoor speaker systems, we knew that this was a brand we could rely on for exceptional quality and design. To that end, we chose 30 pairs of Sonance Visual Performance Series VP66R Speakers for the 19 room installation. With their pivoting dual tweeners providing optimal HF audio in both ambient and single stereo, and with flexible ceiling and in-wall positioning, these 6.5 inch architectural speakers proved the perfect choice to deliver outstanding audio performance in the lounge, hallway, pool area, and other key rooms throughout the home. Externally, we used the next-generation Sonarray System, a model chosen for its ability to deliver optimal sound quality across 185 sqm without compromising the look and feel of the three garden zones. Despite their dynamic range, the Sonarray SR1 speakers with 3.5 inch anodised aluminium cones could be fitted discreetly beneath plants and garden features, whilst the powerful subwoofer could be placed underground to be as near to invisible as possible. Of course, speakers alone are only part of the equation. To access audio content from a variety of sources (such as a media server, streaming music services, and radio) and control the way they sound through those speakers, our client required a multi-room control solution. 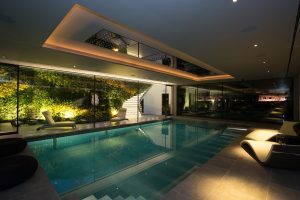 Yet with a home cinema, HVAC system, and intelligent lighting also being built into the home, we knew that the client wouldn’t want the cost and complications of having separate control systems for each part of the installation. Instead, we needed one complete home automation system that would control everything from one place. To achieve this, we went straight to one of the world’s leading home automation control systems, Crestron. 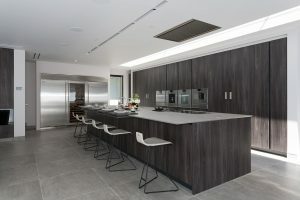 Chosen for its seamless integration with brands like Sonance and the other smart home products we used throughout this installation, as well as for its remarkable ease of use and wealth of customisable options, our bespoke Crestron home automation system gave the client total control over the property from a single application installed on a tablet. The Crestron system continued to work its magic in the custom-designed home cinema room, where once again Sonance was chosen for its superior audio quality. Three Sonance Cinema Series LCR2 in-wall speakers and two VPSUB10-NC in-wall subwoofers were placed behind the screen, with the latter driven by its own Crestron Digital Amplifier. 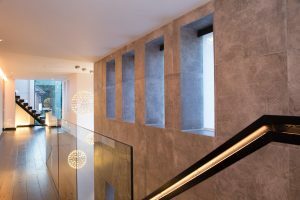 By coupling this with four Sonance VP86S in-ceiling surround speakers, we were again able to create a solution that was next to invisible whilst still ensuring our clients enjoyed the very best in home cinema sound. 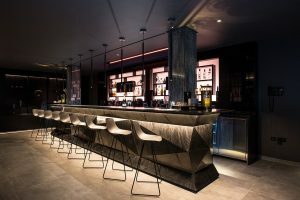 This fully discrete installation was complemented by a custom-built 3m electronic projector, with a casing that was painted to match the in-room cabinets. The JVC X9000R projector was also designed to lower from the ceiling when the whole system was activated, and to ascend back again when not in use. 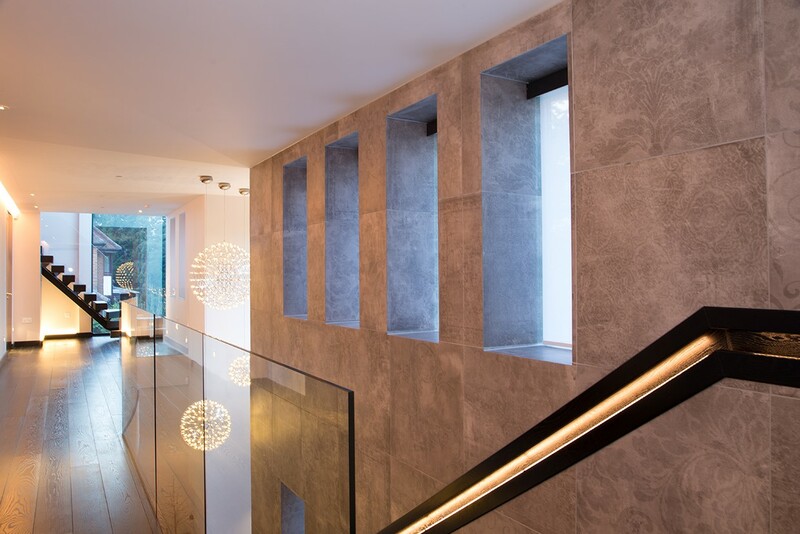 To really make the most of their new home cinema installation and create a true, multiplex-like experience, our client needed to be able to set an ideal lighting scene without going through the hassle of individually configuring each individual light every time they wanted to watch a movie. 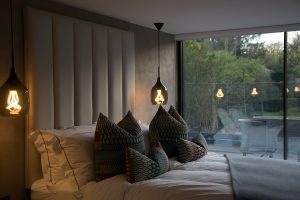 The same was true throughout the rest of the home, where set lighting scenes for different situations and different times of day, where required to ensure the property looked at it best at all times. For this, we knew just where to turn. 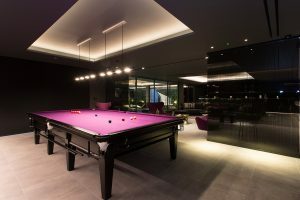 Lutron’s advanced intelligent lighting control solutions were integrated into the home cinema room, pool room, and other living areas and pre-programmed with set scenes for working, resting, and entertaining. We also used Lutron’s smart blind control system to enable the client to make the best possible use of natural lighting, ultimately reducing energy waste and creating a more eco-friendly home in the process. Again, this smart lighting solution could be managed from a simple-to-use app on a tablet or smartphone device. 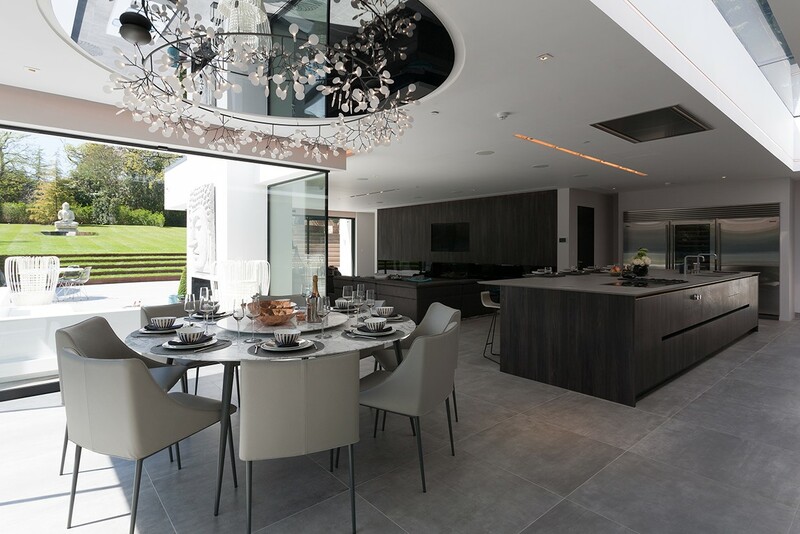 Tying the whole thing together, our clients asked for a solid, reliable wireless system which would not only power the audio and visual components, but would serve as a WiFi solution throughout the whole property. Given the impressive size of said property, coupled with the demand of several residents and multiple AV components, we knew that only Ruckus was the right choice. Comprising a Zone Director 1200 controller, seven R500 Access Points and two Outdoor Access Point T300s, the complete Ruckus 802.11ac system is typical of the brand’s unrivalled flexibility and unparalleled reliability. The BeamFlex adaptive antenna technology and ChannelFly dynamic channel management was utilised to ensure that our clients enjoyed excellent quality coverage anywhere within the home or garden from just a small total number of access points. Last but by no means least, we suggested to our clients that a full fibre network would ensure that, in the long run, they could enjoy maximum data transfer with minimal maintenance with a full fibre network. On agreement, we implemented Cleerline SSF fibre running to all TV points as well as a data cab in the garden. Unlike copper, fibre doesn’t doesn’t degrade, isn’t prone to lightning strikes nor EMI/RFI interference, and loses barely any of its signal strength over 100m. As such, we saw it as the perfect solution to allow for greater data transfer capability across the large expanse of the property without compromising on speed and performance. Inspired by this remarkable luxury smart home to add state-of-the-art sound, video, and WiFi to your property? 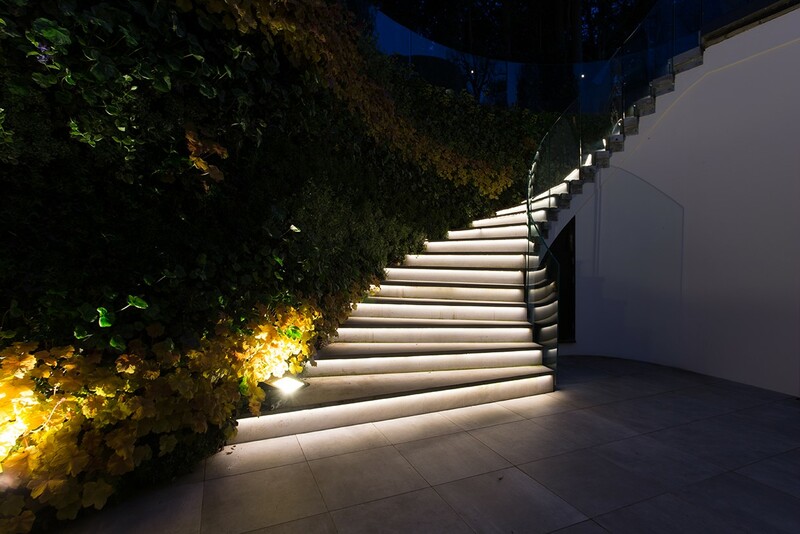 Contact Pro Install AV online today, or call us now on +44(0)20 7096 0078 to discuss your project. The finished installation shows that Sajid and his team really took the time to listen not just to the technical features that I wanted, but to how I planned to use the property post-installation, and designed a system that really focussed making the experience of both relaxing and entertaining as enjoyable and effortless as possible. 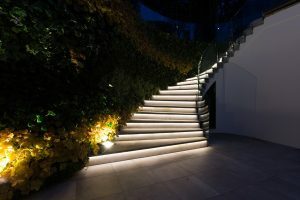 All in all, I am very impressed with an installation that combines superior technology with a focus on quality living. I’d be very happy to recommend Pro Install AV.